When Sky Q was first released it was billed by many as a premium product, not just in price but quality too. It was the first time the satellite giant cracked ‘fluid’ multi-room viewing, while offering Ultra HD picture quality. One area where the set-top box doesn’t quite have control, however, is on the audio side. It can make its picture quality as pristine as possible, but that’s nothing if you’re reliant on the speakers that are built into your television. Sky wants to change that so they’ve teamed up with high-end audio specialists Devialet to produce the Sky Soundbox. This partnership proves that Sky means business when it comes to audio. Devialet is best known for its Devialet Phantom, a speaker that sounds amazing, costs a packet and looks like something out of A Clockwork Orange. With the Sky Soundbox, Devialet has toned down its expressive design creating a much more formal product that should be in-keeping with the rest of your AV setup. 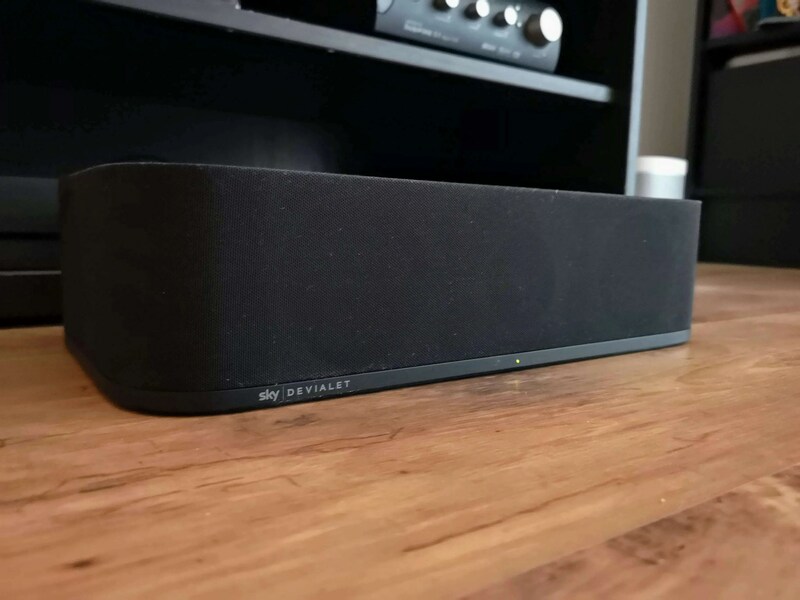 The Sky Soundbox looks a lot like the Sky Q box. It’s black, for a start, has the curved edges that Sky Q – both the mini and Silver – is known for, but it’s a whole lot chunkier and heavier too. In fact, it looks like two-and-a-bit Sky Qs stacked on top of each other (it measures 37.5cm x 21cm x 9.5cm) with Sky branding on the top of the device and subtle dual Sky/Devialet branding on the front. The design certainly doesn’t have the flair of Devialet’s previous efforts but it makes sense to take design cues from the Sky Q box as the majority of people buying this speaker will have that box in their living rooms. Keeping things simple – a theme that runs throughout the Sky Soundbox – there are just four buttons on top of the device to control volume and power. Flip it around (and you’ll need some muscles for this as it weights a hefty 4kg) and there’s an HDMI input and output, and optical input. 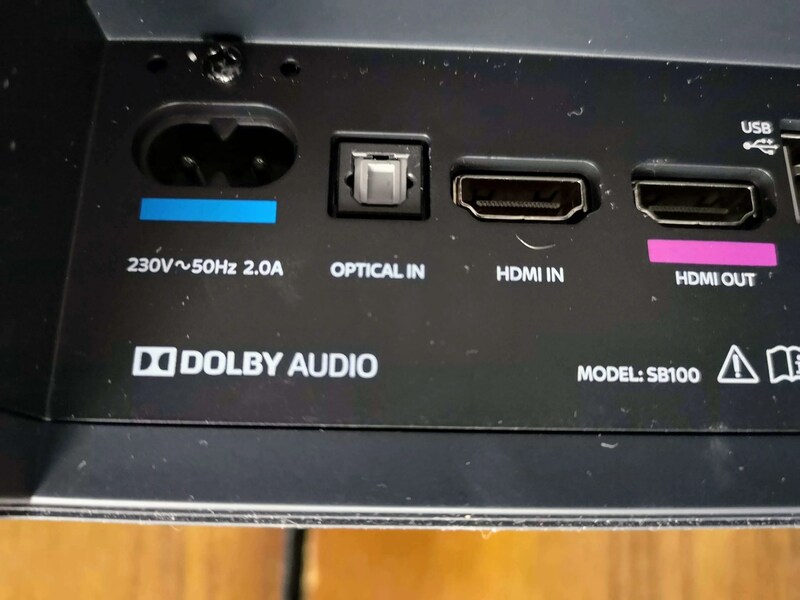 We could have done with an extra HDMI input for additional boxes like games consoles or Blu-ray players, but you can always plug your TV directly into the soundbar through the Optical input. The speaker also comes with Bluetooth 4.1 and Airplay compatibility. The Sky Soundbox is very simple to setup. 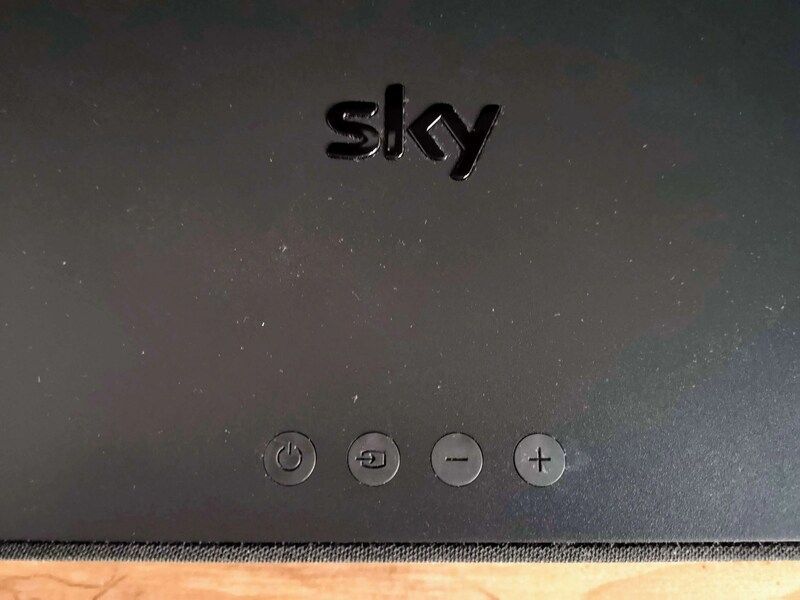 Sky has made it so that when you do connect it to your television and Sky box, Sky Q will automatically know the box is there and will give you access to Q Sound menu in the sound section of the Sky Q menu. Unfortunately, we didn’t have the chance to test the Soundbox out with a Sky Q set up. 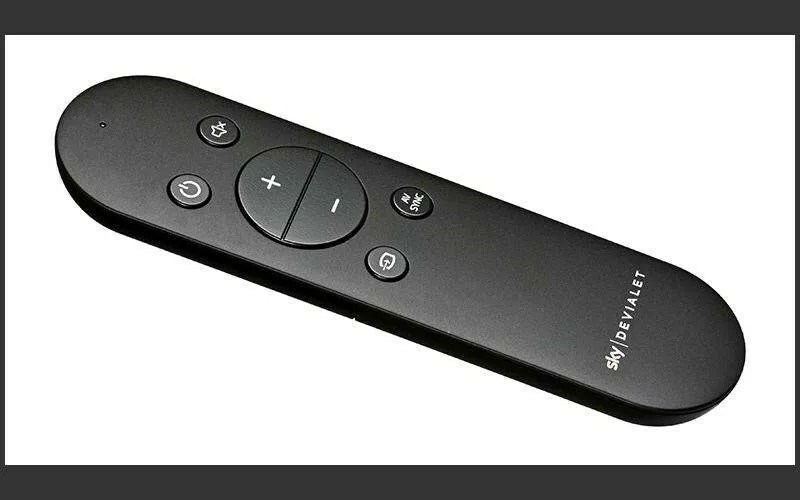 It comes with its own remote but, again, to make it fit seamlessly into a Sky setup, you can use a Sky remote to control the Soundbox. As the Sky Soundbox is meant for the masses, Sky has really paired down the features that come with the device. This is a good thing, everything about the Soundbox feels uncomplicated. When connected to a Sky box, there are a few audio modes you can choose from. There is a Kids mode that controls the maximum volume so young ears aren’t damaged. There is also a Speech mode that really works. Another great addition is Late Night mode. No, it doesn’t add a bass line and raunchy music to what you are watching but instead takes out any sound that will travel (low bass and the like) so you can watch a movie when everyone’s gone to bed and actually hear it without waking the whole house up. Even without these modes, the Sky Soundbar is a seriously clever piece of kit. Sky and Devialet have tuned the speaker so that it automatically adapts to what type of content you are watching. If you are on a Sky movie channel, for instance, it will automatically move into movie mode, when watching sports, it will tune to adapt to a stadium environment. Devialet has also made sure that you won’t be reaching for the remote when watching a movie to turn it up for dialogue and down for explosions. The Soundbox has AVL (automatic volume level) technology inside which means that there’s a fair amount of signal processing going on to balance the volume of whatever you’re watching. 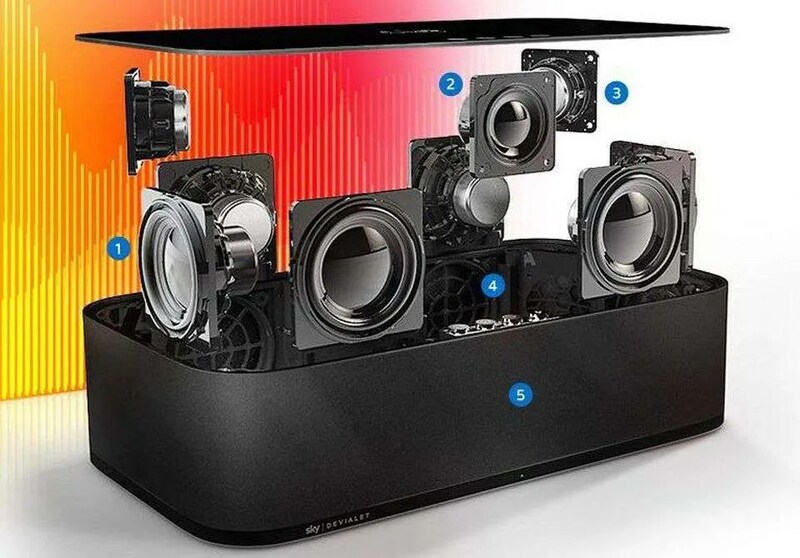 Inside the chassis of the device, there’s six woofers, one full-range driver at the front and two at the back that means sound is bounced off the walls to create an immersive experience. All of this can be piped out at an impressive volume, all while still sounding fantastic. To really test the sound (and the Bluetooth capabilities) of the Sky Soundbar we listened to Yonce/Partition by Beyonce and were blown away by the bass. Ray Charles’ version of Fever hit the high ends with crystal clarity. We really can’t emphasise enough how much sound quality you are getting here for the price… if you are a Sky customer and benefit from the discount. The only caveat is the lack of Dolby Atmos. As this is something that Sky is offering its customers, it feels a little strange that it isn’t offered here. The Sky Soundbox is a stunning-sounding alternative to full-fat audio systems. Its design is un-fussy (almost excessively so) which means that it will fit right in to whatever Sky setup you have. Its design does limit where you can have the box, however, so it may not be suitable for all rooms. Yes, it’s a little chunky but should be compact enough to sit in front of your television without impeding the view. It has also been designed to go in a cabinet setup. Unfortunately this isn’t something that you’re able to wall-mount. It’s really easy to set up and the Q Sound modes available have a real reason to be there. The AVL technology inside means that sound was always well balanced but when you want to crank it up, it can go incredibly loud without losing clarity. If you are a Sky customer, then this is a cut-price bargain. We can’t imagine the technology inside being found anywhere else at this price point. Non-Sky customers may be a little hesitant, though, given the higher price tag. The Sky Soundbox is priced at €949 for non Sky customers but current and new Sky customers can pick one up for €349, with new and existing Sky Q Multiscreen customers able to avail of a further saving with the unit costing just €299.